Takashi Murakami has been a busy boy. With exhibitions already planned at Emmanuel Perrotin (here) this month and Palace of Versailles (here) in 2010, it seems that Takashi wants to make sure thatÂ the “big apple”Â is not forgotten. The legendary Gagosian Gallery in New York will play hostÂ to an exhibition from September 17th – October 24th with a new body of work. This gorgeous painting being worked on looks to be a combo of Murakami’s famed “727-272” and his skulls we saw at his Brooklyn Museum retrospective last year. We spy the assistant working feverishly with a electric-sander grinding down the paint to create Murakami’s signature “acid-washed” surface to the the painting. Hopefully we’ll get to see the completed piece at the show! Image courtesy of Mayo Morimoto @ Kaikai Kiki Studio NYC. Categories: Art, Contemporary Art, Shows & Events, Teasers. 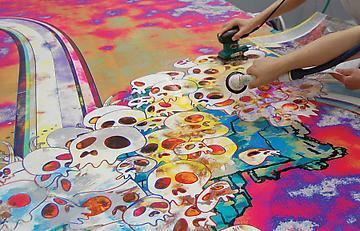 Tags: Contemporary Art, Gagosian, Shows & Events, Takashi Murakami.